This year, with everyone in mind, we have combined our card and gift collections into one catalogue. Within our classic and best-selling ranges, you will find a variety of new products that are launching exclusively for 2019. We are excited to introduce our new ‘Bohemia’ stationery range, featuring beautiful florals and patterns to entice any consumer. Our jigsaw collection has been refreshed and we have an array of bright and colourful designs for all those jigsaw enthusiasts! Our ceramic collection boasts some fresh new artwork and humorous captions, making them the perfect gift. Alongside our gift and stationery, we have been working on over 70 new card designs across our Special Occasions & Thoughts, Family Circle and Age to Celebrate ranges, as well as launching 14 new line extensions. To ensure you have the full package from Otter House in 2019, we have launched a complete refresh of our Gift Packaging collection, including a variety of cute photographic and contemporary illustrations - we have all those special occasions ‘wrapped’ up for 2019. As you can see, the Otter House team have been extremely busy this year, ensuring you have everything you need to make sure your retail space maximises those sales in 2019. 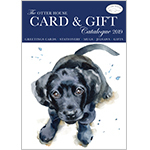 View the Otter House Card & Gift Catalogue 2019.